Many parents are prone to overlooking several aspects of prepping up a nursery. This is understandable, as the arrival of a new baby can be pretty exciting, and some things tend to get left off in the bustle! Still, preparation is usually key in welcoming your baby into a nursery, and it's always better to have everything prepared months in advance. Preparing for the next couple of years can also take place at this time as baby nursery furniture can grow with your family and still stay in style with the modern look and feel of the home. It's always possible to purchase baby furniture based on the overall design of your nursery. In fact, corresponding styles are often a major consideration for parents. Do you have a large nursery? Is space (or the lack thereof) an issue? Whatever the size of your current nursery, it's important that all your furniture corresponds in size, otherwise it might be a little difficult to move around comfortably or give your crawler room to explore safely. Your movement will also be compromised when interacting with your child for those fun days hanging out on the floor. Other than uncomfortable shuffling around in small spaces, babies need the extra space to ensure they don't bump into anything and hurt themselves. Because babies grow quickly, it's important to think big even early on. It is extremely practical to keep a two- to three-year-old in mind when designing the nursery. This will help you decide on furniture that is going to be around for more than a year. Resizable furniture in the form of cribs with conversion kits, or beds that double as changing stations are often practical, cost-effective solutions to the furniture replacement conumdrum. Experts with the necessary know how on baby furniture say that as many as one in five toddlers experience injuries caused by faulty furniture—and that's just below five years old! The numbers show how important it is that parents make not only cost-effective, but responsible decisions when it comes to picking out their baby furniture. The typical baby furniture set includes a crib, changing station and a dresser (or two) for all the necessities. As long as you have at least these three, it's easier to go about designing a stylish nursery for your child. Cribs come in various styles, varieties and sizes, and you can choose modern or traditional cribs to go with your nursery. However, safety as well as design are key to your choice. The Oeuf Classic Crib is the most basic crib design offered by Oeuf, and follows all the necessary safety standards in Europe, Canada, Australia and the U.S.
Other than the crib, you're going to need a couple of cabinets or drawers to keep the nursery organized! The Oeuf Classic 4-Drawer Dresser is a good choice to place all your baby stuff in. Available in either walnut or birch finishes, the dresser is both stylish and durable. Four easily slideable drawers give you more than enough space to hold baby clothes through the growing years. An interesting feature of this dresser is the adjustable legs, in case uneven flooring causes the dresser to rock. Characteristic of most Oeuf products, the dresser doubles as a changing station by simply attaching a separate pad and/or changing tray on the dresser. Another storage unit worth mentioning is the Oeuf Classic Hutch. The hutch serves as extra storage space in case the dresser drawers are no longer enough. The hutch is easily attached to the top of the dresser, providing two additional shelves and a top cabinet with efficient sliding doors installed. Great for mementos, baby supplies or toys! 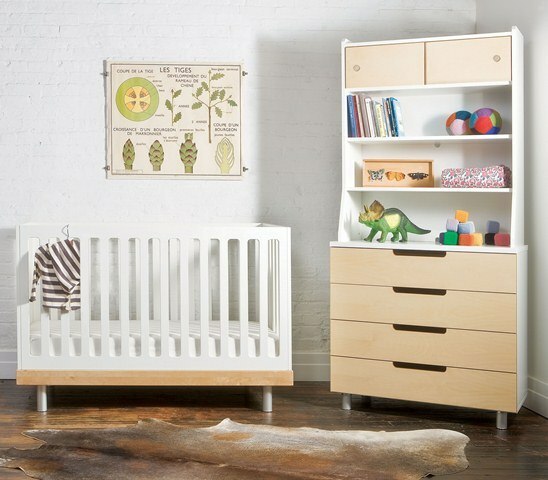 Other than the necessities, you're allowed to get creative by installing additional furniture items in your nursery. Common furniture includes rockers, additional cabinets, a toy chest, and a bookcase. The Oeuf Mini Library is one of the brand's more innovative ways to storing books in the nursery. The unique design appeals to one's creative side, as well as offer extra durability. Store your books in the mini library, either on the shelf, or in the hinged cabinets built into the unit. The library isn't very high, which makes it good for when your child is old enough to pick his own books for story time. For added stability, the mini library can be attached straight to the wall, and you don't have to worry about the whole thing toppling over. You might also want to consider adding a sturdy and stylish nightstand to the nursery, like the Oeuf Sparrow Nightstand. A nightstand is often a perfect place to install a lampshade or nightlight, as well as a favourite book or two that's easy to reach from the bedside. The Sparrow Nightstand also features an extra cabinet below, in case you need additional storage space.